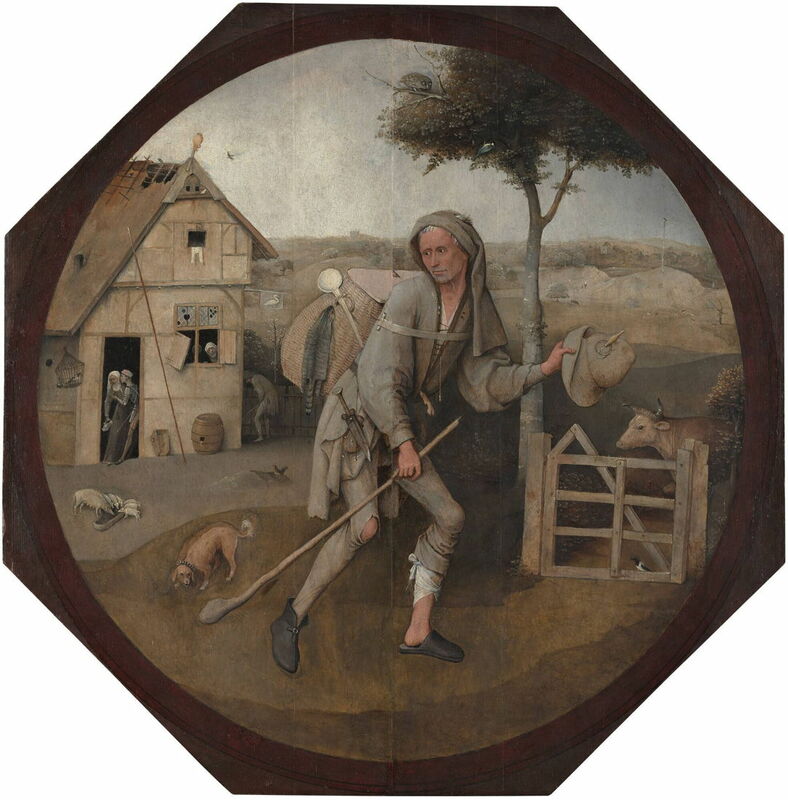 Hieronymus Bosch (c 1450–1516), The Wayfarer (exterior of The Wayfarer triptych) (1500-10), oil on oak panel, 71.3 x 70.7 cm, Museum Boijmans Van Beuningen, Rotterdam, The Netherlands. Wikimedia Commons. Accepted as being four separate paintings until the 1960s, by 2001 it was clear that this group are the remains of a triptych, whose central panel is still missing. Their theme appears to be Everyman’s journey through life, and the choices throughout life between good and evil. Until more detailed analyses were undertaken of these four paintings during the late twentieth century, it had been assumed that they were four separate works. Key to understanding their relationship was The Wayfarer (or Pedlar) itself, which had been turned into a separate octagonal tondo by cutting down and fastening together its two halves, which had originally formed the exterior of the triptych. Since then the interior of the wings have been reconstructed: The Ship of Fools and Gluttony and Lust form the left wing, and Death and the Miser the right wing. As the centre panel is still missing, it is hard to establish the overall theme of the triptych. I will therefore avoid speculation as much as possible and describe it on the basis of the fragments which we have. Hieronymus Bosch (c 1450–1516), The Wayfarer Triptych (reconstruction of wings) (1500-10), oil on oak panel. Wikimedia Commons. The exterior is a circular tondo showing the figure of a travelling man in the foreground, against a countryside background with a single tumbledown building. The man is thin and gaunt, and looks slightly anxiously towards the lower left of the panel. He wears ad hoc clothing for walking: a long-tailed jacket and trousers, with a soft cloth chaperon hat. His clothes are tatty, in need of repair, and a dull grey-brown. The right knee of the trousers has a large hole, and the left lower leg is pulled up above a dirty bandage tied around that a wound in that leg. His footwear is odd, with a short black boot on the right foot, and a low, flat black ‘mule’ on the left. In his left hand, he carries a brimmed hat, which has a bobbin stuck into it, and in his right hand a walking stick, which he holds upside down, its club-like handle close to the ground by his right foot. He has a knife in a sheath secured to his belt, and carries on his back a large wickerwork pack, which is secured across his chest. Attached to the outside of the pack is a ladle, and an animal skin. Behind him, on the left of the painting, is a dog cowed and possibly growling towards him. Behind that is a sow and half a dozen piglets feeding at a small trough. There are also a couple of chickens. Behind the animals is a dilapidated building, which bears the sign of a white swan outside. In the doorway, a man is conducting negotiations with a woman. Another woman looks out from a broken window. At the left there is a bird in a cage, and at the right side of the building a man is urinating by a small fence. To the right of the painting is a small field gate and a tree, behind which is a single magpie on the ground, and a cow. In the distance there is rolling open countryside with scattered trees and a few buildings. 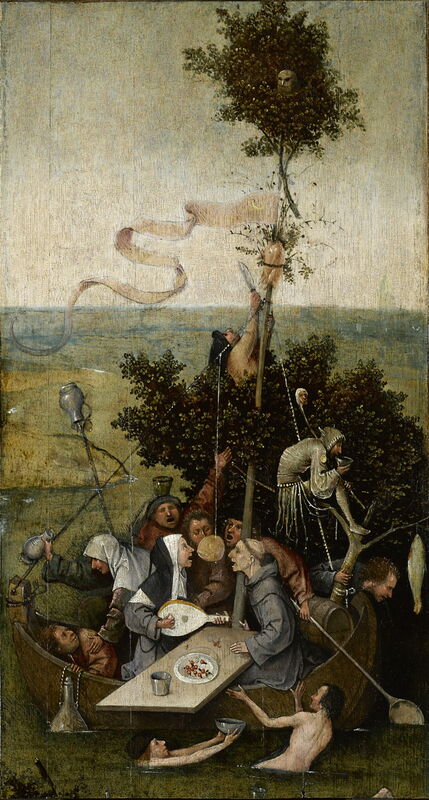 Hieronymus Bosch (c 1450–1516), The Ship of Fools (fragment of left wing of The Wayfarer triptych) (1500-10), oil on oak panel, 58.1 x 32.8 cm, Musée du Louvre, Paris. Wikimedia Commons. 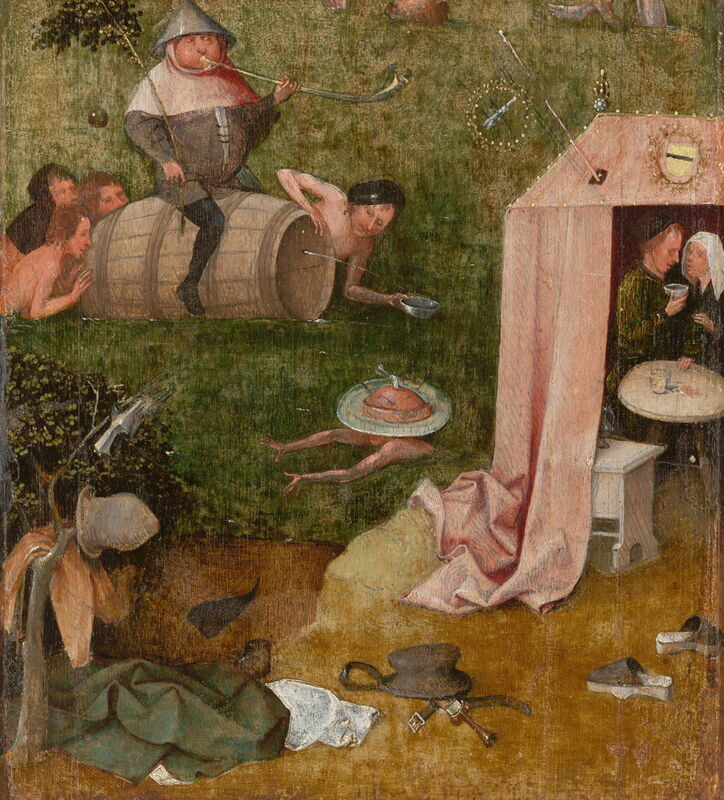 The left wing shows a ‘ship of fools’ in its upper section, below which are scenes of gluttony and lust, on the water and the bank. The ‘ship of fools’ is actually a small boat, into which six men and two women are packed tight. Its mast is unrealistically high, bears no sail, and has a large branch lashed to the top of it, in which is an owl. The occupants are engaged in drinking, eating what appear to be cherries from a small rectangular tabletop, and singing to the accompaniment of a lute being played by one of the women. One man at the bow is vomiting overboard, near a large fish which is strung from the branch of a small tree. Another of the passengers holds a large spoon-like paddle, which would be of little or no use either for propulsion or steering. There are four additional characters (all men): two are swimming by the side of the boat, one, dressed as a fool, is perched high up forward in among the rigging, and the fourth has climbed a tree on the bank to try to cut down the carcass of a chicken from high up the mast. The vessel flies a long red pendant from high on its mast, with a gold crescent moon on it. The distance shows relatively flat countryside. Hieronymus Bosch (c 1450–1516), Gluttony and Lust (fragment of left wing of The Wayfarer triptych) (1500-10), oil on oak panel, 34.9 x 30.6 cm, Yale University Art Gallery, New Haven, CT. Wikimedia Commons. In the foreground, a round and very portly man (who wears an inverted funnel on his head) sits astride a floating barrel, which is being pushed through the water by three swimmers. A fourth swimmer catches liquid which is squirting from a hole in the end of the barrel. Nearby a swimmer carries a large salver of food on their head, and appears to be making for the shore. On the shore is a red tent, inside which a man and woman are close to one another and drinking together, beside a round white-topped table. Strewn on the bank in the immediate foreground are items of clothing of the swimmers, including shoes (clogs), hats, a belt with a knife in a sheath, and various garments. An armoured glove hangs from a bush at the left. Hieronymus Bosch (c 1450–1516), Death and the Miser (right wing of The Wayfarer triptych) (1500-10), oil on oak panel, 94.3 x 32.4 cm, The National Gallery of Art, Washington, DC. Wikimedia Commons. The right wing shows a frail and emaciated man in bed, being tended to by an angel, with a devil poised above him, and the figure of death coming in through the door. The scene is a barrel-vaulted bedroom which goes deep, and is furnished with a large bed with a canopy and side-curtains. At the foot of the bed is a large chest containing money and valuables. In the foreground, the bedroom ends in a pillar at each side, with a low wall joining them. Garments are laid on that wall, and items of knightly armour just outside it. The latter includes a helmet, sword, shield, an armoured glove, and a lance. An old man, presumably a servant, wearing green robes, with a walking stick and rosary, stands on the right of the chest, his right hand extending into a bag of gold coins inside the chest. The key to the chest is suspended from his belt. The thin man in bed sits upright, against a high bolster and pillows. A bag of money is on the bed in front of him, being held by a small devil. On that man’s left side (to the right in the painting) is a winged angel, who holds the man’s left shoulder. The angel looks up and holds his right hand towards a crucifix which is placed against a window high in the wall. The figure of death is shown as a skull on a near-skeletal body and limbs, holding a long silver arrow in its right hand. That arrow points towards the man in bed. Peering over the canopy above the bed is a small devil who holds a lantern on a rod. More devils are seen under the chest, one holding up a document with a red seal on it. Another devil is looking over the frontmost low wall, by the garments laid on it. The dilapidated building shown on the exterior is without doubt intended to be a brothel, which has no sanitary facilities, but encourages drinking. Hieronymus Bosch (c 1450–1516), The Ship of Fools (fragment of left wing of The Wayfarer triptych) (detail) (1500-10), oil on oak panel, 58.1 x 32.8 cm, Musée du Louvre, Paris. Wikimedia Commons. 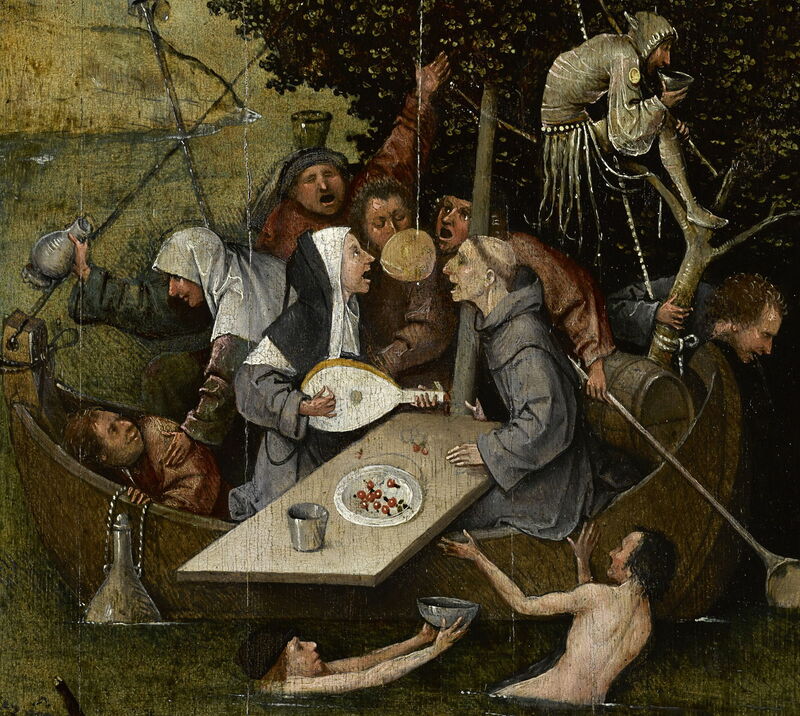 The boating party are seen engaged in lustful and drunken activities, once again showing Bosch’s association between music and sin, and the symbolism of fruit. The man and woman seated opposite one another by the tabletop, providing the musical entertainment, appear to be a monk and a nun. 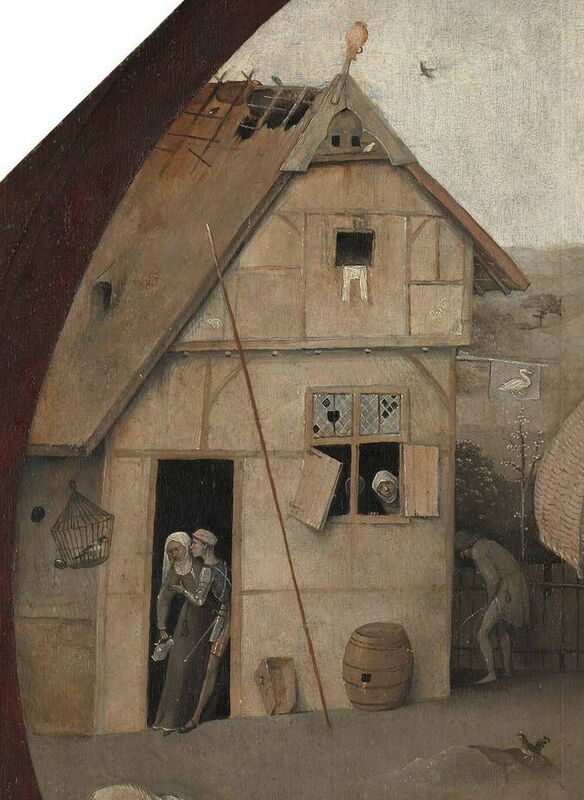 Hieronymus Bosch (c 1450–1516), Death and the Miser (right wing of The Wayfarer triptych) (detail) (1500-10), oil on oak panel, 94.3 x 32.4 cm, The National Gallery of Art, Washington, DC. Wikimedia Commons. 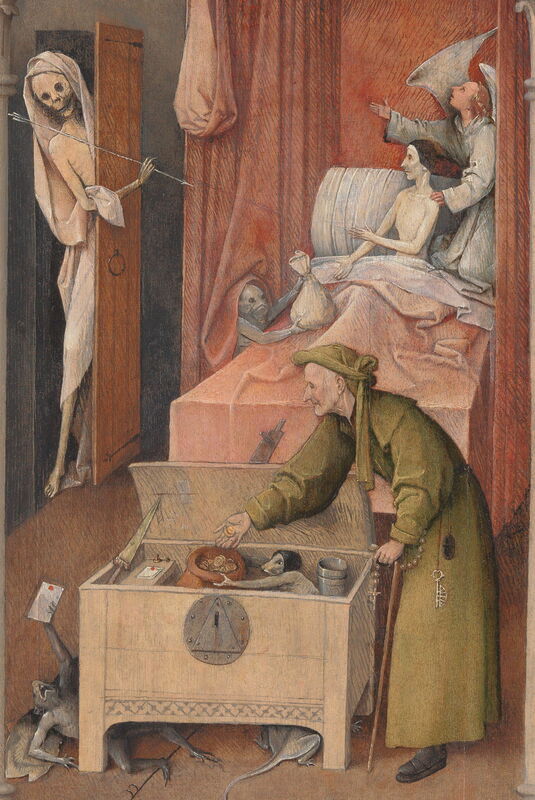 With the figure of death about to deal its fatal blow, the miser in bed is faced with the choice between right (represented by the angel and crucifix) and wrong (the various devils). The exterior painting and wings convey a simple moralistic story about the human journey through life, its many temptations and choices, and their consequences. The exterior is intended to represent the pilgrim making his journey through life, much as he does in allegorical literature such as John Bunyan’s later Pilgrim’s Progress, rather than as a figure on a real pilgrimage. His pack does not necessarily contain goods for sale, which might have made him a pedlar, as has been suggested. Ilsink et al. trace the ship of fools to Das Narrenschiff, by Sebastian Brant, published in 1494, although this visual recreation is Bosch’s alone. The boat shown has no sails set, and is pointing into the wind in any case, unable to make any headway. It is overloaded and unstable too: an excellent allegory for those on board and their indulgence in sin. The miser is about to die, and even at this late moment an angel offers him the chance of repentance, and redemption of his soul through Christ crucified. So too do the devils entice him to grasp his money and worldly ways, and descend to hell. No one knows when the original triptych was broken up, and the provenance of the surviving fragments dates back no more than two centuries. As a result, each has undergone considerable modification, including parts which have been overpainted, and altered their appearance significantly. 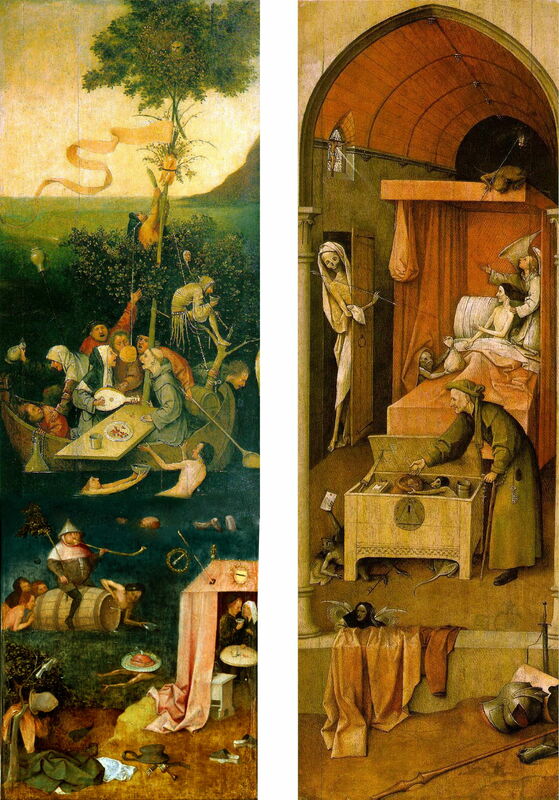 It has been claimed that the underdrawings should be attributed to a left-handed artist, and that Bosch is supposed to have been right-handed. Ilsink et al. doubt that the underdrawings of these panels were necessarily painted by a left-hander, and consider that even if they were, the finished paintings were made by Bosch himself. It is also a matter of dispute as to whether Bosch was left- or right-handed. Matthijs Ilsink, Jos Koldeweij et al. (2016) pp 316-335 in Hieronymus Bosch, Painter and Draughtsman: Catalogue Raisonné, Yale UP and Mercatorfonds. ISBN 978 0 300 22014 8. Is OS X getting too overextended for its own security?